Please read these Terms and Conditions ("Terms", "Terms and Conditions") carefully before using the www.greaterthangold.com website (the "Service") operated by Greater Than Gold ("us", "we", or "our"). Your access to and use of the Service is conditioned upon your acceptance of and compliance with these Terms. These Terms apply to all visitors, users and others who wish to access or use the Service. By accessing or using the Service you agree to be bound by these Terms. If you disagree with any part of the terms then you do not have permission to access the Service. The Service and its original content, features and functionality are and will remain the exclusive property of Greater Than Gold and its licensors. The Service is protected by copyright, trademark, and other laws of both the United States and foreign countries. Our trademarks and trade dress may not be used in connection with any product or service without the prior written consent of Greater Than Gold. Our Service may contain links to third party web sites or services that are not owned or controlled by Greater Than Gold. Greater Than Gold has no control over, and assumes no responsibility for the content, privacy policies, or practices of any third party web sites or services. We do not warrant the offerings of any of these entities/individuals or their websites. You acknowledge and agree that Greater Than Gold shall not be responsible or liable, directly or indirectly, for any damage or loss caused or alleged to be caused by or in connection with use of or reliance on any such content, goods or services available on or through any such third party web sites or services. You agree to defend, indemnify and hold harmless Greater Than Gold and its licensee and licensors, and their employees, contractors, agents, officers and directors, from and against any and all claims, damages, obligations, losses, liabilities, costs or debt, and expenses (including but not limited to attorney's fees), resulting from or arising out of a) your use and access of the Service, by you or any person using your account and password, or b) a breach of these Terms. In no event shall Greater Than Gold, nor its directors, employees, partners, agents, suppliers, or affiliates, be liable for any indirect, incidental, special, consequential or punitive damages, including without limitation, loss of profits, data, use, goodwill, or other intangible losses, resulting from (i) your access to or use of or inability to access or use the Service; (ii) any conduct or content of any third party on the Service; (iii) any content obtained from the Service; and (iv) unauthorized access, use or alteration of your transmissions or content, whether based on warranty, contract, tort (including negligence) or any other legal theory, whether or not we have been informed of the possibility of such damage, and even if a remedy set forth herein is found to have failed of its essential purpose. Greater Than Gold its subsidiaries, affiliates, and its licensors do not warrant that a) the Service will function uninterrupted, secure or available at any particular time or location; b) any errors or defects will be corrected; c) the Service is free of viruses or other harmful components; or d) the results of using the Service will meet your requirements. Copyright 2016 by Greater Than Gold, Inc. This ebook publication is provided free of charge by Greater Than Gold Inc. www.greaterthangold.com. 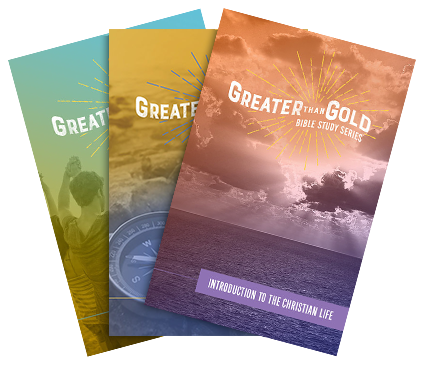 Permission to download and print one (1) copy is granted only to the individual directly downloading the document and who has provided the required information, and is only to be used for individual Bible Study or as a sample of Greater Than Gold’s titles for vetting purposes. Beyond the downloading and printing of one (1) physical copy, no part of this publication may be reproduced or transmitted in any form or by any means, electronic or mechanical, including photocopying, recording, or by any informational storage or retrieval system without written permission from Greater Than Gold, Inc., except for the inclusion of brief quotations in a review. Greater Than Gold Inc. reserves the right to discontinue this offer at any time without notice. These ebook publications are provided for a monthly subscription fee by Greater Than Gold Inc. www.greaterthangold.com. Permission to download and print one (1) copy is granted only to the individual directly downloading the document and who has provided the required payment information, and is only to be used for individual Bible Study. Beyond the downloading and printing of one (1) physical copy of each study, no part of this publication may be reproduced or transmitted in any form or by any means, electronic or mechanical, including photocopying, recording, or by any informational storage or retrieval system without written permission from Greater Than Gold, Inc., except for the inclusion of brief quotations in a review. License Grant Fee. Effective from and after the date below, in exchange for a one-time payment of $250.00 USD from Distributor to Greater Than Gold, Greater Than Gold hereby grants to Distributor a non-exclusive, royalty- free license to use the Licensed IP to make copies of and distribute the Licensed IP solely for the limited purpose of ministry for church related uses in the geographical United States. Other Considerations. In addition to the License Grant Fee, it is hereby agreed that during the term of the Agreement, Distributor will provide Greater Than Gold with 3 (three) testimonies, stories or reports, along with pictures detailing the effectiveness of the use of the product and how lives are being impacted. Titles. Greater Than Gold will make its best effort to provide to Distributor as many titles as the Distributor requests and can reasonably distribute during the term of the Agreement. Greater Than Gold may at its sole discretion withhold some titles requested. Hard Copies. Distributor may make any number of paper copies of the applicable Licensed IP as is reasonably necessary to accomplish the permitted uses stated in Section 2.1 during the year in which the Distributor is operating under the License Agreement. Greater Than Gold may ask for and shall be given anticipated distribution quantities and for a written quarterly or annual report. Digital Copies. Creation or distribution of electronic or digital copies of the IP is strictly prohibited. Sales. Distributor may not sell the Licensed IP or monetize it by any means, including receiving a donation in exchange for the Licensed IP, without express written consent from Greater Than Gold. Exclusion of All Other Rights. Except as expressly provided in this Agreement, Distributor is granted no rights or licenses whatsoever in or to the Licensed IP or any other of Greater Than Gold’s products, services or other intellectual, proprietary property or personal rights, including the Christian Worker Bible Study Series and/or any products formerly produced, sold, or distributed by Global Youth Evangelism, whether by print or digital means. Greater Than Gold owns and reserves all rights and licenses not expressly granted in this Agreement. In particular, nothing in this Agreement conveys to Distributor the legal title to any Licensed IP. Right to Sublicense. Distributor has no right to grant sublicenses to any third party unless Greater Than Gold provides its approval in writing. Intellectual Property Notices and Markings. For any copy made of the Licensed IP pertaining to the copyrighted materials, Distributor must accurately reproduce the Licensed IP with the proper copyright notices attributing the Licensed IP to Greater Than Gold as follows: © Copyright 2016 Greater Than Gold Inc. Term. This Agreement shall continue in force for an initial period of one year and will automatically be renewed for periods of one (1) year each, upon payment of annual License Grant fee of $250.00 USD unless either party gives notice of non-renewal to the other party at least thirty (30) days prior to the end of any one (1) year term. The notice will terminate this Agreement upon expiration of the then current term. Upon any breach of any of the duties and obligation of Distributor under this Agreement. Effects of, and Procedure upon Termination. Upon the expiration or termination of this Agreement, Distributor agrees immediately to discontinue all use of the Licensed IP, and that all rights in the Licensed IP and the good will connected will remain owned by Greater Than Gold.